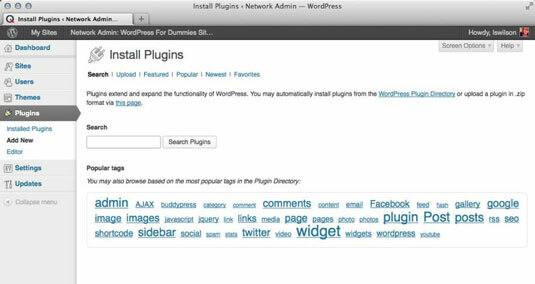 After logging in to your WordPress Dashboard, click the Add New link on the Plugins menu. You then see the Install Plugins page, which you use for installing plugins from inside the Dashboard — it’s also where you can search for plugins. At the top of the Install Plugins page are a series of links that provide a number of ways to find plugins. This page allows for searching the WordPress Plugin Directory either by using a list of terms you type in the Search box or by clicking one of the popular tag links to quickly narrow the list of plugins. Search for the term Gallery. After you use either of the search options, the page changes to a Search Results page, which lists the plugins that match the search query. The search results provide a wealth of information about each found plugin. 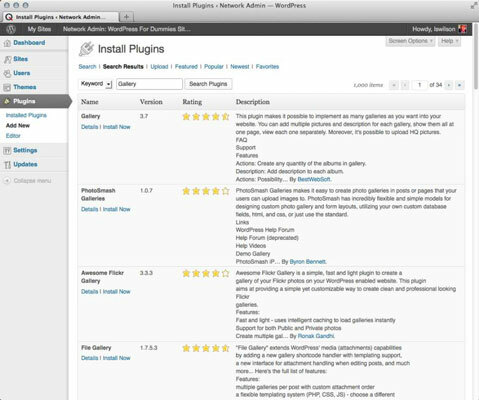 For each plugin listed on the page, the search results show the plugin’s name, current version, rating, and description. Two links for each plugin appear below the name of the plugin — click those links to discover more information about the plugin and install it. Click the Upload link on the Install Plugins page to display the Upload section. The Upload section allows for easy installation of downloaded plugin Zip files without using FTP or some other method to upload the files to the server. This feature makes it very quick and easy to install downloaded plugin Zip files. While you can do this with plugins you find in the WordPress Plugin Directory, this feature is mostly used to install plugins that are not available in the Plugin Directory because they cannot be installed by searching for them in the Install Plugins page. After selecting the Zip file to upload and clicking the Install Now button. The options to go back to the Install Plugins page or to activate the newly installed plugin are available. The Featured, Popular, and Newest pages are all very similar. The Featured page shows just the plugins listed as Featured in the WordPress Plugin Directory. The Popular page includes a listing of all the plugins sorted by their popularity. The Newest page lists all the plugins sorted with the newest plugins listed first with the oldest coming in at the end of the list. Beyond these differences, each page is identical to the Search Results page. Each of the listed plugins provides options to view more details about the plugin and to quickly install the plugin.